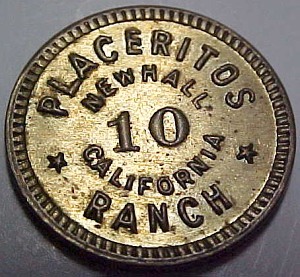 Ernie Hickson minted brass tokens in 5-, 10-, 25- and 50-cent denominations when he turned the Western street at his Placeritos movie ranch (later Melody Ranch) into "Slippery Gulch" for the Newhall Old West Association's 4th of July carnival 1949, '50 and '51. Patrons had to trade in their federal greenbacks for the tokens, which were redeemable for refreshments and merchandise at the concession stands  and which were inserted into Hickson's one-armed bandits. A century after Francisco Lopez the big enterprise in Placerita Canyon wasn't gold, but movies. Ernie Hickson threw open the doors to his Western movie town at the Placeritos Ranch in 1949, '50 and '51 and invited the community to celebrate the 4th of July at "Slippery Gulch." Patriotism ran high after World War II. In 1948 the newly formed Newhall Old West Association took over the operation of the parade  held locally since 1932  from Newhall's sheriff deputies, who had organized it in the immediate post-war years. With a board consisting of Newhall's most prominent business and community leaders, the association created an unparalleled July 4th celebration that glorified Newhall's heritage as a frontier town. This, after all, was a time when our heroes were cowboys and everything "Western" was the rage. Activities included the parade on Spruce Street (San Fernando Road today), a beauty contest, a horse show, kids' games on the Newhall Elementary School grounds, a dance, and a fireworks display from Bermite's sister company, Golden State Fireworks, at Bonelli Stadium (Saugus Speedway). But move it did, when Hickson offered up his movie ranch for the festivities in 1949. The organizers must have felt as thrilled as the city of Santa Clarita was 45 years later when the same movie ranch was offered as the venue for the annual Cowboy Poetry and Music Festival. That's right  the Placeritos was renamed "Melody Ranch" when Gene Autry bought it, and then as now, the public has a once-a-year opportunity to see it. Yours is coming next weekend; call the city at 286-4021 for ticket information. Back to the story. The 1949 event was billed as "the biggest Old West celebration in the history of Newhall." An estimated 12,000 revelers packed the Placeritos, where they could take in a vaudeville show, pick up a copy of the Slippery Gulch Gazette (printed by Signal Publisher Fred Trueblood), or write a letter on special Pony Express stationery and watch it being packed into saddlebags and ridden off to the Newhall Post Office for a commemorative postmark. At sundown a wooden dance floor was spread out on the dirt street, with free entertainment until midnight. There was plenty to drink  sodapop for the kids and boatloads of "low-percent beer" for the grown-ups. "Between the Bird Cage Theatre and the Gazette office was the Palace Saloon," Trueblood writes in The Newhall Signal. "Here in a perfect old-time Western setting, amateur bartenders passed out beer until they dropped from exhaustion and fresh relays took over. ... It ran all day and night until the beer supply was exhausted." Money was no good  regular U.S. currency, that is. Visitors had to stop off at the "Wells Fargo office" set and trade in their federal dollars for Slippery Gulch tokens. Hickson had them specially made for the occasion. 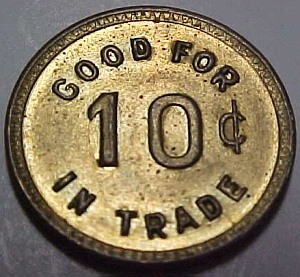 Minted in brass by Los Angeles Stamp & Stationery Co. (formerly Los Angeles Rubber Stamp Co.)*, they came in 5¢, 10¢, 25¢ and 50¢ varieties, with "Placeritos Ranch / Newhall, California" and the denomination on the obverse, and "Good For (X amount) In Trade" on the reverse. They were the only way for patrons to get a soda, beer, barbecue or anything else from the concessionaires. It's the concept that's still used at carnivals and events where "real" money is exchanged for event currency (usually mass-produced tickets from a discount store). It's a way to boost the gross and keep tabs on the loot. The take at Slippery Gulch was a few thousand dollars, which the Newhall Old West Association used to put on the following year's event. But the 1949 event that had promised to be the "biggest Old West celebration in the history of Newhall" probably was. Attendance tapered off to about 6,000 by 1951. Hickson, up in years, died Jan. 22, 1952, and the association was in a bind. In July 1952 they moved the festivities to Spruce Street and tried to replicate their success, but it didn't work. There wasn't enough publicity, most merchants didn't participate, the association was having trouble recruiting volunteers, and to top it off there was a heat wave. By 1955 even the parade nearly didn't come off. The town eventually got back into the spirit of things  but that's a tale for another day. Postscript: In 1968, Anillo Industries of Orange, Calif., purchased the inventory of Los Angeles Stamp & Stationery Co. and struck uniface (one-sided) aluminum examples from that company's 3,492 original dies, including the "Slippery Gulch" tokens in all denominations. It is believed that only four sets of the restrikes were made.